First, some back story. McKenna got to a point in the library that she was no fun to take. She was loud, she would not stay where I told her to, and she loved to pull book after book off the shelves. Obviously these are not the most desireable traits to have in the library. Let me tell you, our library is a new library and the person who designed it obviously has never taken a child to the library! It is lovely and bright, but completely open. It is one large room and the materials used in it lead to severe echoing! Sounds travel across the building at the speed of light. The floor in the children’s section is tile. Oh my. It is neither cozy nor noise absorbing. Okay, done with my rant on the library design. I have to work with what I have, and that means libary behavior needs to be at 100%. First, make a list of clear goals you want. What is it your child is doing that is undesireable? What does she need to learn in order to reach the desireable behavior? Make your list of concrete goals. Like any behavior you want to have in public, for library behavior, you need to start with the basics at home. If your child doesn’t listen to you wat home, why would she in public? Make sure she obeys at home before you expect obediene when you are out. Next, practice behaviors at home. You don’t teach public behaviors in public. It is a great place to practice what you have learned at home, not to teach. Does your child know how to whisper? If not, then telling her to in a public library will not produce the results you are seeking. You need to teach at home and practice at home. If you have other children that can and will distract you from the child learning library behavior, go with just that one child. Brayden and Kaitlyn are very well behaved in the library, and during our intense training time, I still only took McKenna. I wanted her to be my one concern and worry. The tricky thing with a child a few kids in is that she quickly figures out that when mom is distracted, she can get away with things. And with other children to take care of, mom is often distracted. Sure, she gets caught and stopped at some point, but she got to have fun until then. This third child of mine is a master at reading me. She is also very patient in waiting for that right moment. As soon as she sees me distracted, she will seize the moment. This is a unique skill she has over my older two. With two, I am never distracted enough to let a child slip under my radar. When you go to the library during intense training, go with training as your primary goal. Don’t go intending to find 15 great picture books on apples. Your goal is not books–it is library training. 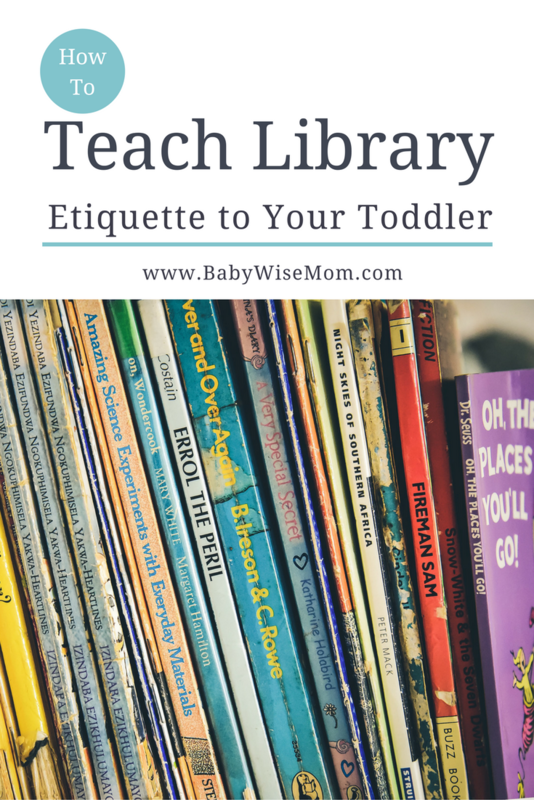 I still looked at books and choose books, after all, I was working on teaching her what to do so I could get books in peace with her behaving at the library, but if I needed to completely drop what I was doing, I was ready and willing to do so. I did not let her get away with one inch during training. Because I am consistent with her at home, she knew I was serious at the library. It really only took a couple of times at the library focusing on training to get things under control. And now it is so easy! I tell her where to sit. I tell her which books she can look through (they have bins of toddler books that are not organized), she is quiet, and she listens to me. I am so glad that I put the effort into training. I think her favorite place to go is the library. It was well worth the effort it took to teach her how to behave at the library. Could you give more specific examples of how you trained her? I understand the concept but I'm interested in what the training actually looked like. Great post! A common problem! Yes! Thank you so much Val. We just moved and I checked out our new library with both my children 3.5 and 19 months yesterday…it was a dismal failure, so this post is very timely. ~ It went something like this: 19 month old boy saw a youth book with a dog on the cover and started running around yelling "whhooff whoof"…I put him back in the stroller and my 3.5 year old daughter who has been toilet trained for a year proceeded to say "I have to pee" and started going…and couldn't stop! Yikes….we cleaned up, grabbed some books and made a fast get away. ~We're going to work on quiet sitting and quiet voices at home and then try again (when mama is trying to check out 30 books for homeschooling!) Thanks for the encouragement! Great post! Really love the training concept. I probably should've done it this way with DD #1, but she learned very quickly once I left with her a couple times when she wouldn't listen and stay put. With #2, who is a little more, um, spirited, I will definitely try this. I'll really have to work on this lack of childcare thing though. Don't know who I would leave her with. Laura, I gave her rules and just didn't let her break them. So she wanted to play with the computers, which obviously isn't very appropriate for a two year old to do unsupervised. I told her she couldn't play on the computer. She didn't listen. So I took her to a chair and held her on my lap–basically as a time out. She didn't like that. But she tried it again, so we sat in the chair again (just sitting–no books or anything). After that she listened. She knew she wasn't going to get away with it, and she also knew that looking at books is more fun than sitting in a chair doing nothing. snydsy33, I think leaving if she isn't being good is a perfect move, also. If the child loves being at the library, she won't want to do things to be taken away. Ditto Jen P – if I were to hold my son while sitting in a chair, he would likely pitch a fit (because all HE wants to do is run around and play). I realize I am the parent, so I definitely want to train/encourage appropriate behavior, but without causing a major disruption to other library patrons. Suggestions?Along those lines, I have read and understand the idea of figuring out beliefs/goals and the "why" for various behavioral expectations; However, I feel that I am lacking in the "how" department. Do you perhaps have suggestions (or could point me to a blog post) for various discipline strategies (e.g., a toolbox of sorts) that new parents could utilize, since we know that different strategies work with each individual child? Thanks so much if you can help – you are awesome!